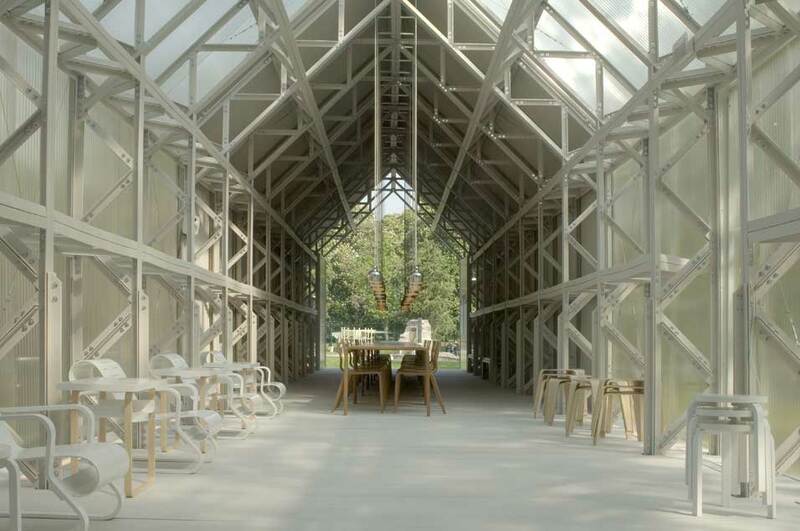 prefabricated pavilion, which has been exhibited in Milan, Helsinki, and Miami, demonstrates the ingenuity of design in offering alternative environmentally friendly spaces in the 20th century. The Artek Pavilion is estimated to sell for $800,000/1.2 million* and is being offered on behalf of Proventus, the majority owner of Artek, with the proceeds being donated to arts and culture affiliated charities. is approximately 2 meters wide; this module is repeated 21 times. The entire pavilion is 40 meters long and 5 meters wide and can be taken down and re-assembled easily. This nomadic construction, an unconventional piece of ecological innovation with elegant beauty, stands for Arteks attitude to sustainable development, amplifying the dialogue between design, architecture and art. to the use of paper, cardboard and bamboo as construction materials, combined with a cleanlined and contemporary architectural aesthetic, have made him one of the most important architects of our time. In 1995, he started Voluntary Architects Network (VAN), sharing his awareness of housing shortages and deplorable living conditions in various parts of the world. Bans work reflects the influences of both American architectural training and the traditions of his native Japan. The Artek Pavilion was first presented by Artek and the forest products group UPM in April of 2007, in Salone Internazionale del Mobile in Milan, Italy, in the triennial garden, a legendary platform in international design. In September of 2007, the Pavilion was erected in Helsinki, Finland in the area between the Museum of Finnish Architecture and the Design Museum. In December of 2007, the nomadic pavilion was reconstructed and placed on exhibition for the third time at Design Miami, Florida. Pavilions as architectural manifestations and exhibition spaces for furniture and lighting have had a significant role throughout Arteks history. They have had global influence in the fields of architecture and design as tangible representations of an era  and materialize the on-going Artek ideology of promoting humane and innovative design in the present. The most well known examples of these pavilions go back to the 1930s, to the Paris (1936-37) and New York (1939) World Fairs. These pavilions were designed by the Finnish architect and designer Alvar Aalto and furnished by Artek, the company he founded in 1935.